Last night, MoMa hosted its annual Party in the Garden gala fundraiser, attended by moneyed donors and board members, including the president emerita and honouree Agnes Gund, and ending with a concert by St Vincent. Meanwhile on the street outside, around 250 unionised museum workers and their allies gathered at a Party on the Pavement to protest what they say are “unjust” contract negotiations. 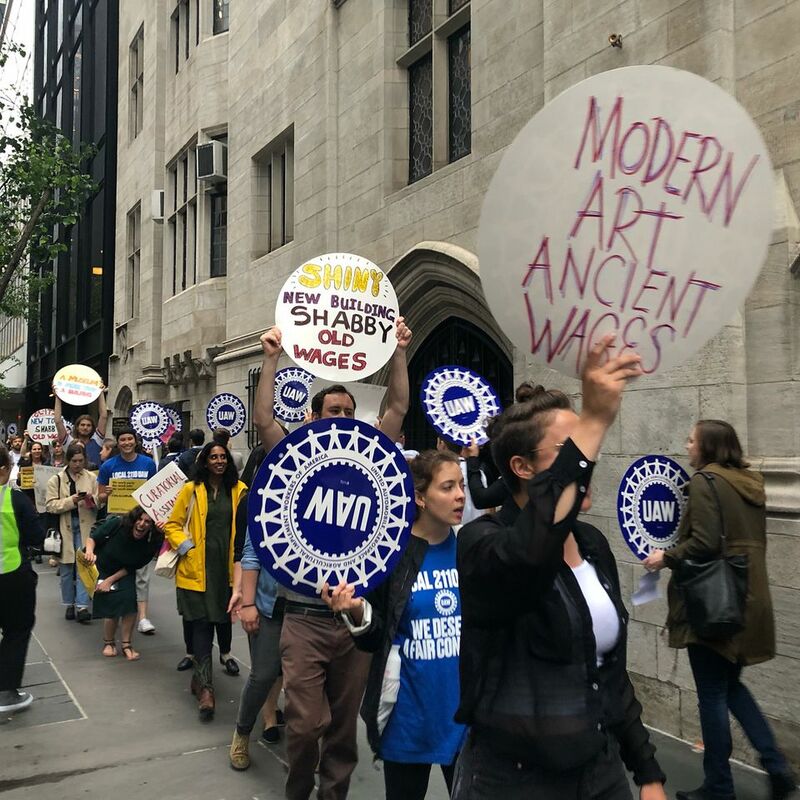 Wearing bright blue t-shirts emblazoned with the words “We Deserve Fair Contracts”, the protesters carried hand-made signs that read: “Modern Art Ancient Wages” and “Glitzy New Tower Shabby Old Wages”, referring to the MoMA’s $400m expansion, currently under construction. Maida Rosenstein, the president of the United Automobile, Aerospace, and Agricultural Implement Workers Local 2110 union, which represents around 250 staff members in MoMA’s curatorial and publications departments, library and store, says the museum is trying to “lowball them economically”, through low wages, threats to cut health care, and little-to-no overtime pay. Rosenstein said the aim of the protest was to bring awareness to the attendees of the gala and the larger public of the museum’s treatment of its workers. But it was also meant to highlight the irony of honouring the philanthropist Agnes Gund, “know for her liberal political stances in funding art and social justice,” while “not taking a very just stance towards their own staff”, Rosenstein adds. The union is due to re-enter negotiations with the museum next week.